Enjoy life elevated above downtown with panoramic views of the city of San Luis Obispo & surrounding peaks. Rarely seen in such close proximity to downtown, the property is set on 2 acres above the coveted Anholm district. 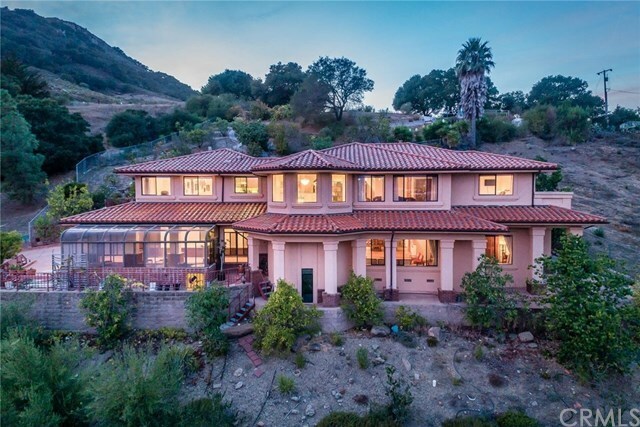 This expansive estate offers privacy, while being mins from everywhere you need to be. Oversized picture windows throughout this grand home offer sun-drenched rooms with iconic views. Featuring a wood burning fireplace with rock wall, oak wood floors throughout, sweeping staircase and abundance of rich wood craftsmanship, the property is filled with character. The unique space enjoys two open concept spacious living areas on both levels of the home, accessed by a centrally located elevator. With 6 bedrooms & 4 baths, and each level offering its own kitchen, dining and living areas, there are an abundance of potential uses. Featuring two spacious en suite bedrooms with private baths & one with a private balcony, all 6 bedrooms offer large closets, oak floors & big windows. Other features include spacious 3-car garage, large laundry room, ample storage, finished basement & dual zone central air/heat. The 2-acre grounds offer patios, mature oak trees and an assortment of fruit trees including lemon, persimmon & more. With easy access to everything the Central Coast has to offer, the home is just .5 mile from downtown, 1 mile to Cal Poly, 15 mins to sandy beaches & Edna Valley wineries & in close proximity to shopping, schools & more. Directions: Take Chorro, go West on Lincoln Street, right on Hill Street. Private driveway on left side of cul-de-sac. Please do not disturb occupants.